Criticism, isn’t it a simple word whose meaning everyone understands? Yet, how you deal with it can make or break you. Every one of us has received it and every one of us has been generous enough to shower it on someone else. Even the almighty God is not spared by us. 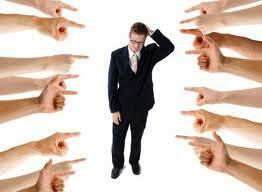 A person who takes action gets criticized for taking action. Someone gets criticized for inaction. An individual gets criticized for speaking while another gets criticized for keeping quiet. Hiding away from criticism will invite more criticism. Taking it head on will also be an act that would get criticized. You may take a decision keeping in mind the best interest of everyone. However, the people whose interests you are trying to safeguard could be the ones with the most bitter of words for you. Someone you had helped tide a difficult phase will not bother to thank you for it. In fact, he may at some point in the future criticize you for it. Difficult it is to deal with such people. However, running away is not a solution if you have to deal with such people day in and day out. Criticism is unavoidable. One needs to keep his cool when dealing with it. This is a skill not easy to develop. Being emotionally weak doesn’t help. One has to face it with courage. Personal experience has taught me that getting bogged down by unwelcome comments doesn’t help. Also, reacting to every criticism that comes your way is also foolish. You will waste precious energy that could have been spent on some creative pursuit. Patience I feel is very important for dealing with criticism. One needs to wait and watch. Stay calm. Listen peacefully and analyze. Is the person criticizing you virtuous enough to use such words for you? Ask yourself whether the words being used have any merit in it. This is the only way to get a better handle of the situation and not break down. Spending some quiet moment with self each day is also important. This will ensure that you look at things from the right perspective.